With STRUMIS steel fabrication management software and its many functionalities, steel fabricators are able to more effectively and efficiently manage all of their machines and workstations. The capability of the workstation or machine, including each one’s capacity, can be monitored and tracked and manipulated in such a way that fabricators are getting the most out of each workstation; thus creating better timings for your shop. We all know that better labour timings results in costs savings which ultimately adds to any and all steel fabricators’ bottom line. 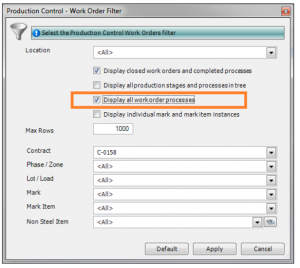 Within STRUMIS’ ’Production Control’ module we are able to manipulate our workstation/machine views in a way that allows to easily see only the specific information we want to see. 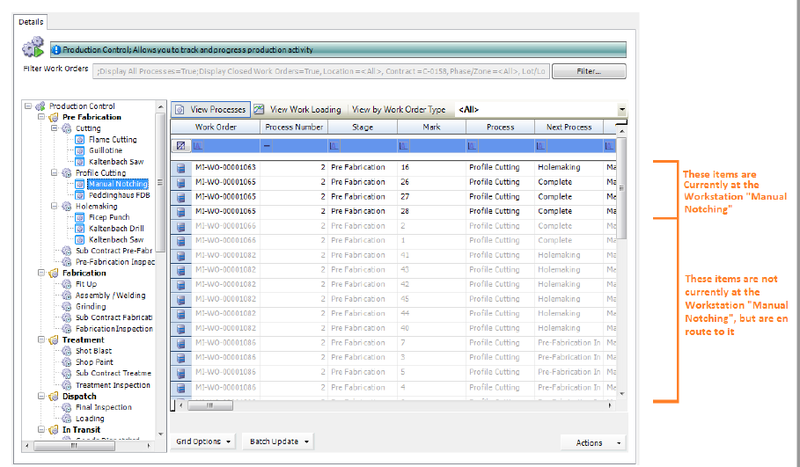 For example, the image below shows how flexible STRUMIS is in allowing us to display work orders for a certain contract, or alternatively we can view all work orders and processes that are currently in production in our fabrication shop; once again contributing to the flexibility of the software as a whole while still being easy to use. 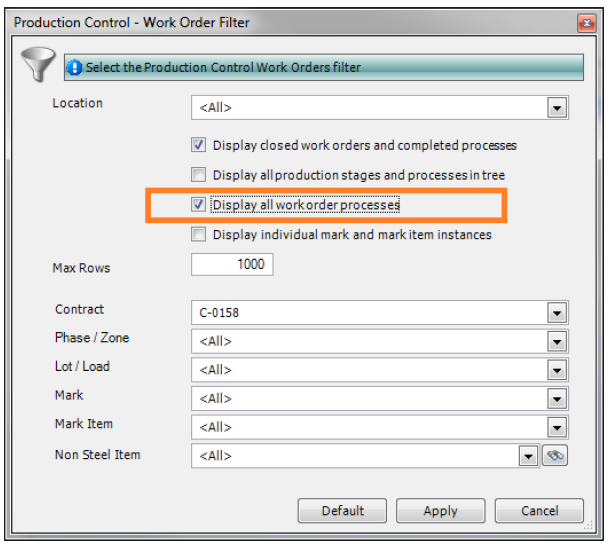 Checking the button below allows Production Control to show both items that are currently at the workstation as well as items that are routed to go to the workstation but aren’t there yet. Furthermore, we are able to track future movements in our shop to see where work orders are going to go, not just where they currently are in regards to routing items through our shop. 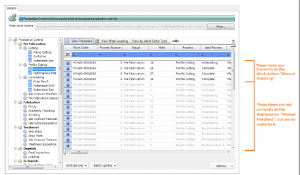 Moreover, we can extract useful information from these views within STRUMIS utilising a variety of options. Our ‘grid options’ tab allows you to filter, summarise, and/or group items to see only the information you’d like to see at a certain time. From there we are able to print this information out, email it by connecting directly with Outlook, or export the grids to Excel. 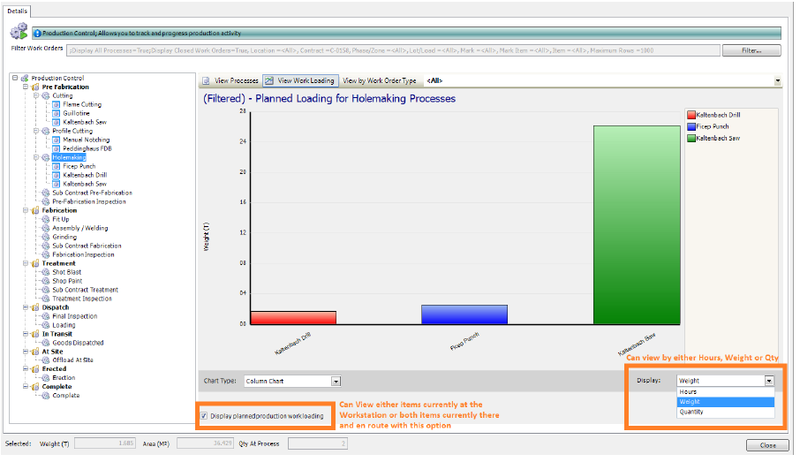 Lastly, we can view our work loading as a graphical representation for a workstation or a process. STRUMIS are proud to be partnering with the Kaltenbach International Partners in Steel (IPS) event in Lörrach, Germany, from the 16th – 19th of May. The IPS is a complete event: Unique demonstrations of the latest processing technologies, practically oriented seminars as well as exclusive excursions will inform visitors about the latest state-of-the-art technology. In addition, the technologies and trends for tomorrow can also be seen. To learn more about the IPS please click here. STRUMIS are proud to announce that we are sponsoring the Fisher Cycle Challenge which will take place on Saturday the 20th of May 2017. Get on your bike, get fit and help raise some much needed funds for charity. Join us for a fun, challenging day cycling around Fermanagh this spring. Choose from 22, 45 or 75 mile leisure cycle, starting and finishing at Severfield (NI) in Ballinamallard. Open to all ages & abilities. Free t-shirts, refreshments and food at finish for all cyclists.